Straight from the beginning rush of chords this will sound oohh! so familiar...yet different! And that kids is how it should be! 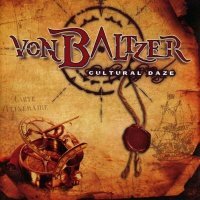 'Von Baltzer' is a grouping of some of Europe's top modern Rock masters and piloted by producer extraordinaire Magnus Johansson. Yes, what we hear is vintage Melodic Rock, with all its pomp, ceremony and classic signatures - but in a way that we have not heard performed before! The group is made up of four stars in their own right. Guitarists Christian Kjellstrom and Erik Palmqvist, who have created these inspiring epics. Equally so the lyrics are written and sung by Ian Parry, with Magnus Jacobson laying down these all-important drum runs! The four are joined by keyboardist Per Ramsby adding the ivory touch to these ten precious gems! 'Cultural Daze' is classic in nature, but modern in performance. Each musical creation is a swirling mass of instruments topped by exquisite vocal stylings. The group are all things - they rock at the highest form, each selection melodic beyond measure. The riffs are fully embodied and bold! No covers here friends, each track is brand new and created by these brilliant four. Yes 'Cultural Daze' will certainly bring back loving memories of music from the eighties, and nineties...but with a blistering sheen that is completely 21st century! Heartfelt and flawless: 'Von Baltzer' are about to elevate AOR to new heights! Don't be afraid to 'Flick The Switch' and play this disc 'Night And Day'!